Two score and ten years ago our parish fathers brought forth in this city of Perth Amboy, a new school conceived in high expectations, dedicated to the promotion of Catholic ideals of education according to the teachings of Christ. The assignment for the Missionary Sisters of the Mother of God, “Go teach all nations”. The personnel staffing this school never ask what they can get out of their labor, but focus rather on what they can do to make this school flourish and the students learn to be good Christians and supportive citizens of the country. Although founded for the specific mission to be a parish school, ACS spread its wings to embrace all ethnicities, and soon became a haven for any student who sought entrance through its doors, regardless of ability, background or religious affiliation. The mission of this school as recently redefined reads: Assumption Catholic School is a small, diverse, family oriented school which promotes Catholic values, academic distinction, higher order thinking, personal responsibility and knowledge of the Ukrainian Catholic Rite and heritage. This has been the hallmark of this educational institution from the very first day. For 50 years many loving children have spent their formative years within these walls, and all have been taught the same lessons, lessons of faith, the teachings of Christ and His church, lessons of personal responsibility, honesty and integrity, lessons of love, of service and mutual respect for all . Since its humble beginnings in the early sixties, this school has been richly blessed with giving souls who spared nothing to make the teachings of Christ available to all. The wisdom of our leaders, the Bishops, the dedication of Pastors who carried out their directives, the untold sacrifice of the generous people of Ukrainian Assumption Parish , the continual caretakers of the property, the administration of the school, teaching faculty, and the school parent community formed the pillars, the glue so to speak, that allowed the creation, progress and success come to reality. Our parent organization, formed in the early years of the school. devoted countless hours to fundraising activities. There have been bazaars, fashion shows, a 25 club, candy sales; you name it, they’ve done it! On this day of celebrating its GOLDEN Anniversary, Assumption Catholic School can proudly boast of its labor of love. It has seen many of its graduates succeed as professionals in the fields of medicine, law, education, business and the arts. Many have “come home” to teach in the same place they were taught, to willingly provide assistance, or bring their children to the same classrooms, to sit in the same seats they once occupied. It is difficult to describe our joys as we welcome back our graduates and hear them proudly tell of their leadership roles in high school, their reception into National Honor Societies, or to display their certificates of achievement and boast of scholarships to advanced halls of learning. Three of our now grown “little boys” are the pride and glory of our parish and school. They are Fr. Paul Makar, a successful engineer who answered the call to the priesthood and is now working in the Archeparchy of Philadelphia, Fr. Taras Naumenko, a priest in the Ukr. Orthodox Church and Anthony DeStefano , who recently began his theological journey in preparation for ordination in the Archdiocese of Newark Anthony is a successful lawyer who answered the call of Christ after many years of law practice. The members of our faculty and staff, both past and present, who faced the task of testing the endurance of this teaching institution’s ideals, deserve much thanks, admiration, and appreciation. From the fruits of their efforts, we can proudly boast that we have planted a multitude of seeds that have blossomed into trees of success. The world will little know of the labor, sacrifice, prayer, and of dedication that have gone forth from these walls, but it will reap the fruit that has sprung forth in achievement and success. ACS has had the good fortune of having a stable faculty ,some of whom have dedicated their lives’ vocation to teaching in this school. As aforementioned, we have also been blessed with graduates dedicated to the teaching profession, who chose to begin their careers at the school they knew and loved so well. Presently we can boast of four of our alumni either as full time or part time teachers . Our school lawyer is also a graduate of the school. I extend a warm welcome to all, as we gather together to rejoice and celebrate 50 years of dedication, based upon a grand, sweet labor of love, prayers, sweat ,tears and YES, joy and success! For some of you, this building appears the same; for others it has greatly changed. Some of us recall two small classrooms on the first floor, the school office behind the stage, and Fr. Sulyk’s living quarters in the present school office. We can picture the playground as a field full of weeds, or the basement as an unfinished, impassable area where we occasionally had gym with Mr. Gumbs our first gym teacher, sent to teach at ACS by the city of Perth Amboy. Many changes have taken place, thanks to the love and labor of our Pastors and numerous dedicated individuals who have made things happen throughout the years. Now, all classrooms are finished and filled with happy faces. They are also supplied with updated, technological, state of the art equipment, providing internet access to all classrooms. ACS was one of the very first schools in the country to install internet throughout the building. The basement is now a multifunctional education center consisting of a comfortable learning library, a computer lab and a spacious science laboratry. The school office is no longer a tiny hidden back room, but a spacious two room complex complete with computers and computerized copiers, which have replaced the old purple rexograph machines and those known as “ the inky, stinky mimeograph “copiers. Report cards are no longer hand written , but instant on line print outs. The Honey Well Instant Alert System provides the blessing of not having to sit for hours and make individual phone calls for emergency reasons or for early dismissal announcements! Power School allows for spontaneous teacher – parent communication, and Acellus , an optimum online learning program, is accessible to all students. Indeed, ACS has proven to be a great mover into 21st century instruction! In an age when various Catholic schools are concerned about the loss and focus of their identity, Assumption Catholic School has retained hers. It is at the forefront of all its activities and remains its main emphasis. The recitation of daily prayer, weekly Liturgy, monthly opportunity for the Sacrament of Penance, thorough preparation for First Penance and solemn Holy Communion, daily catechetical and religion instruction, monthly rosary and May devotions all contribute to moral growth and strength of character. The emphasis on service to others, respect and politeness deserves a special mention. No institution can survive for any length of time without good leadership. ACS has been continually blessed with dedicated, strong leaders: Bishop Yaroslaw Gabro, the initiator and designer of the school, Archbishop Stephen Sulyk who labored tirelessly to see the building completed, staffed and built on a strong academic foundation, Fr. Roman Dubitsky’s 30 years of care and solicitude over the progress of the school, and Fr. Ivan’s strong involvement with the school, the students, the administrative leadership and the faculty, are to be highly commended. 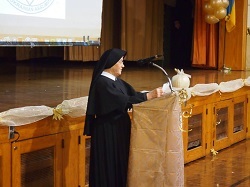 Sr. Josepha, the first principal, who was both a teacher and an administrator for over 30 years, laid a solid foundation from the very beginning. The principals that followed, including our current principal, Mr. Michael Szyhulsky, supported and built upon this foundation. Assumption Catholic School offers its students not only curricular knowledge, but guidance in developing critical thinking skills , enthusiasm for learning and self esteem . It prepares students not only for success in academics but provides them with a good foundation for a well rouded Christian Catholic LIFE. Our teachers are role models in the classroom, and are dedicated to improving themselves, their students and their community. They are not just professional persons, but educators, persons whose vocation is to develop other persons. They deserve much credit for having proven themselves in this important Christian calling. May the blessing of Almighty God, The Father, the Son and the Holy Spirit descend and remain forever upon this school and those who will support its work, teach and study in it.” For two score and ten years God’s blessing has been with us. In a sense WE cannot dedicate, or consecrate this institution. Those individuals, living or deceased, who lovingly spent their energy, talents and expertise have dedicated and consecrated it with the help of the grace of God. May Almighty God and His divine assistance remain forever upon those who will come here to learn and those who will dedicate their lives and talents to continue to teach as Christ taught, ask not for personal gain, but for spiritual and intellectual growth.